The Higher Education Policy Institute and Youthsight have polled students for their current political views, voting intentions and opinions about Brexit. 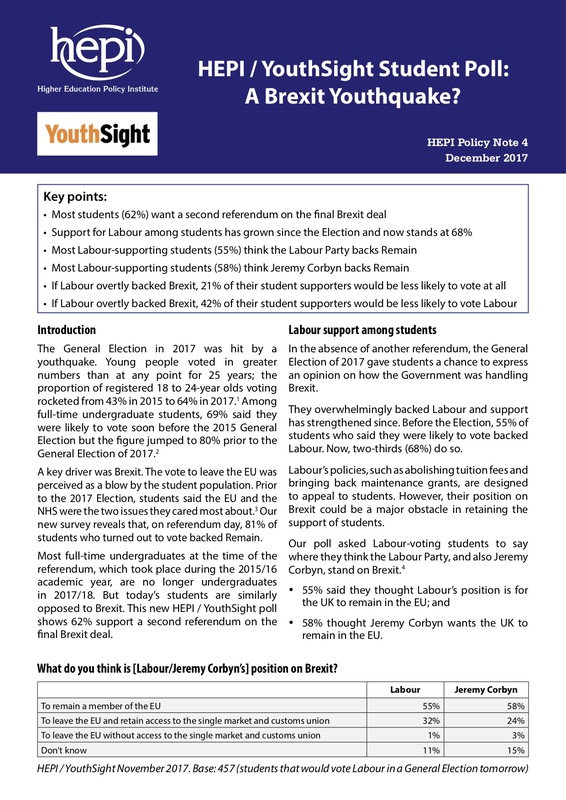 The results are being published in A Brexit Youthquake (HEPI Policy Note 4) by Jane Mackey, Research Manager at Youthsight, and Nick Hillman, Director of the Higher Education Policy Institute (HEPI). Students are often regarded as having a fixed place somewhere on the left of the political spectrum. But no political party can take them for granted. Jeremy Corbyn did incredibly well among students and in university cities at this year’s general election. However, this strong support could turn out to be as soft as past student support for the Liberal Democrats. It all depends on Labour’s position in relation to Brexit for nearly all students oppose the UK leaving the EU. While two-thirds of students back Labour, over half of them think Labour is a pro-Remain party. If their perceptions changed, then a high proportion would be less likely to support the party or to abstain from politics. Our data show that students’ understanding of Labour’s position on Brexit is based more on hope and projection than understanding and reality. Jeremy Corbyn and the Labour Party need to make their position on Brexit crystal clear if they want to retain the support of students. If they don’t, then the party could find their much-vaunted youth vote simply melts away. Given Labour’s standing in the national polls currently, the party’s position on Brexit could be the crucial factor determining whether or not they taste victory at the next election. This poll builds on work undertaken by both HEPI and Youthsight on students’ political impact. For example, HEPI has previously published two full-length reports on the political impact of students: Do students swing elections? Registration, turnout and voting behaviour among full-time students by Stephen Fisher and Nick Hillman (December 2014); and Students and the 2015 general election: Did they make a difference? by Nick Hillman (October 2015). Wave 4 of the HEPI-Youthsight Monitor was conducted between 23 and 29 November 2017 among 1,018 students using YouthSight’s Student Omnibus survey, which is the UK’s largest panel of young people. The Monitor has been running since 2015: Wave 1 covered students’ perceptions of the UK’s membership of the EU (2015); Wave 2 considered free-speech issues (2016); and Wave 3 looked at how students were likely to vote in the 2017 election (2017). HEPI was established in 2002 to shape the higher education policy debate through evidence. We are UK-wide, independent and non-partisan. We are funded by organisations and universities that wish to see a vibrant higher education debate as well as through our own events. The full data is available on the Publications page.